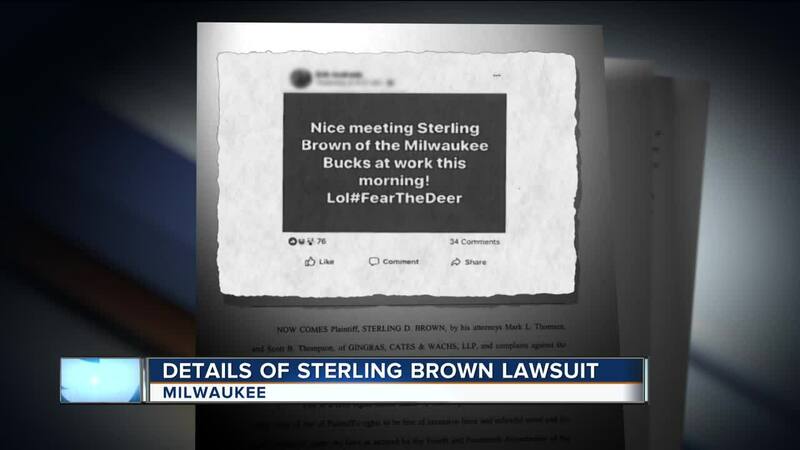 A 40-page federal, criminal complaint filed Tuesday morning by Sterling Brown's lawyer details alleged civil rights violations during the NBA player's arrest in January. 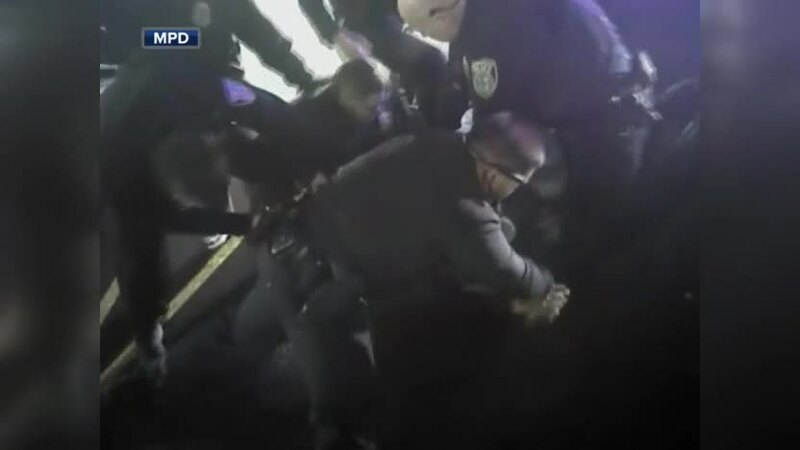 Brown was tackled and tased outside of a Walgreens after an officer spotted his vehicle parked in two handicap parking spots. He was transported by ambulance to St. Francis Hospital and ultimately taken to the Milwaukee County Jail. But Brown was never charged with a crime in connection with the incident. The complaint names the City, Police Chief Alfonso Morales, Sergeants Sean Mahnke and Jeffrey Krueger, and Officers Joseph Grams, Bojan Samardzic, James Collins, Cristobal Martinez Avila, Erik Andrade and Jason Jensen as defendants. Mark Thomsen, Brown's lawyer, writes in the complaint that his client was subjected to "unlawful, racially motivated and excessive force and detention." 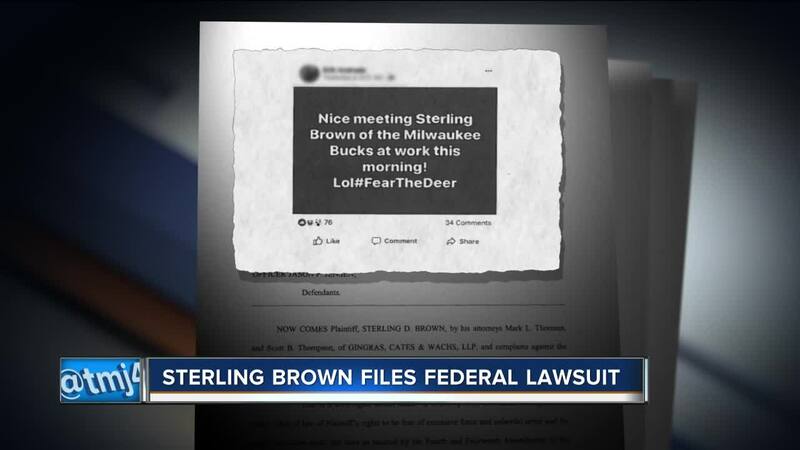 "Mr. Brown had not committed any crime, and there was no reason to suspect that Mr. Brown was in the process of committing a crime, or that he would ever commit a crime," Thomsen said in the complaint. At a news conference outside of City Hall Tuesday afternoon, Thomsen stressed that parking in a handicap spot is not a criminal offense. The complaint also includes screenshots of Facebook posts allegedly made by Officer Erik Andrade following Brown's arrest. One of them reads: "Nice meeting Sterling Brown of the Milwaukee Bucks at work this morning! Lol #FearTheDeer." "Defendant Andrade took to Facebook to mock and laugh at Brown," Thomsen said in the complaint. Mahnke was suspended for 15 days following the incident. Krueger received a 10-day suspension, and Samardzic was suspended two days, according to the federal complaint. The other officers involved were required to undergo re-training. In the documents filed Tuesday, Thomsen said the disciplinary measures weren't adequate. "Chief Morales' investigation and disciplinary actions were not complete and incompetent and/or constitute an attempted cover up of the defendants' unlawful conduct," he said in the complaint. Ald. Mark Borkowski said he thinks MPD procedures need to be reviewed and the changed in the wake of Brown's arrest. "We need to improve, and we will improve," he said. But Borkowski added he stands by Morales. He also noted that Edward Flynn, not Morales, was the Chief of Police at the time of Brown's arrest. "I place some of the blame on the previous regime," Borkowski said. "Chief Morales is kind of cleaning up. I think he's doing the best he can." To read the full lawsuit complaint, click here .